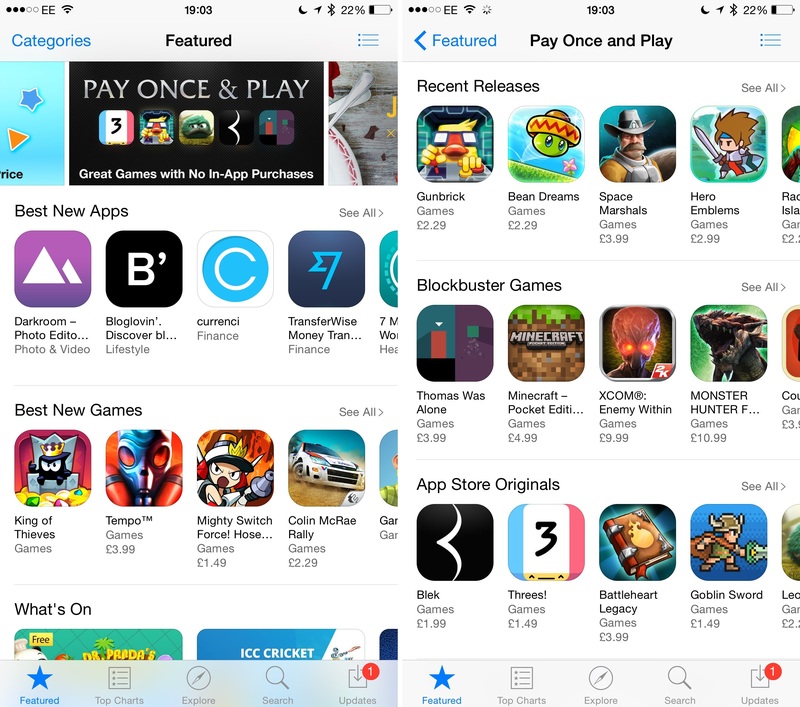 The section is organized in Recent Releases, Blockbuster Games, and App Store Originals. The games included vary in terms of popularity and developer: Apple is promoting indie hit Thomas Was Alone under Blockbuster Games alongside Minecraft, but they're also showcasing award-winning Threes, Leo's Fortune, and Blek. Over the past few years, Apple has dealt with numerous complaints and investigations over the nature of freemium games and how they were advertised as free downloads while effectively hiding major gameplay features behind In-App Purchases. The company brought a series of changes to the way freemium games were displayed on the App Store – it added a specific label to indicate IAPs, and then changed the button to download freemium games from “Free” to “Get”. It's unclear whether the new section will be regularly updated or become a permanent fixture of the App Store's front page, but it's a good sign as it shows an interest in promoting quality game experiences that don't follow typical (and lucrative but potentially confusing) freemium trends.